Today one of my friend ask me, can she add the AdSense in the middle of the post by using the code I posted in How to add AdSense inside a post. I told her no, she can’t and I promised her to add the trick later. I thought not to delay it any more. So this post will show you how to put AdSense anywhere inside your post. 1. First you should go to your adsense account and grab the code for your adsense ads. 4. Copy the converted code. 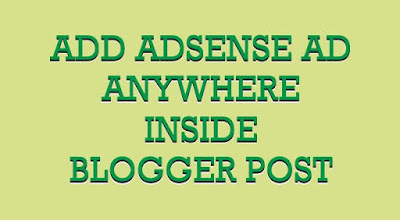 Note:- that you must replace <!-- Your AdSense code --> with block code provided by Google. in the exact point you want to appear AdSense advertising. You can Put this code Several times in same post as per your Requirements.